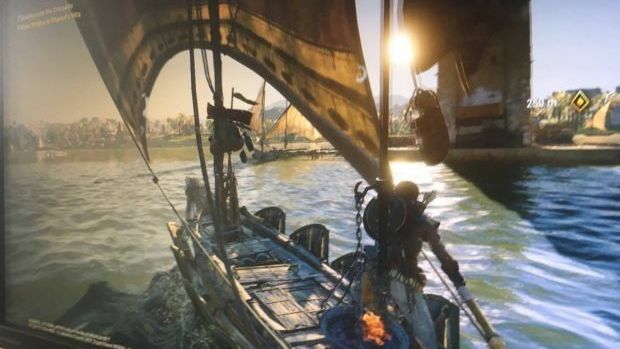 It’s still not officially announced, but everyone and their mother knows about Assassin’s Creed Origins, knows that it is set in ancient Egypt, that it is a prequel to the rest of the franchise, that it is coming this October, that it has naval traversal, that it takes inspiration from The Witcher 3 and incorporates RPG elements. Now, we have another leak to establish the legitimacy of all of this. The cover for the new Game Informer, as well as the new Game Informer itself, have been leaked. The cover story establishes loads of cues taken from Witcher and Zelda, including more RPG elements (which itself seems to be inspired by the Sphere Grid leveling system in Final Fantasy 10), a dynamic open world (you can deflect enemy arrows with your shield, and then recover them later, as one example; animals will attack other animals in the open world), underwater swimming, tomb raiding, a new combat system, the removal of the in game minimap (instead, it seems like there will be an Elder Scrolls/Horizon style compass at the top), enhanced enemy AI, a change in Eagle Vision to bring it more in line with the Witcher sense in Witcher 3, and full Xbox Scorpio optimizations. You can catch the details regarding this for yourself on NeoGAF. It all sounds like it’s coming together as the culmination of everything Assassin’s Creed has tried to be over the last few years. Can Ubisoft pull it off? That remains to be seen. Presumably the game gets announced this E3, so stay tuned to GamingBolt for more coverage and information.